My approach to National Novel Writing Month consists of five main components: 1. A catchy title (see above). 2. An enticing synopsis (see below) which gives me a plot arc to follow but plenty of leeway to veer (way) off track as necessary. 3. My NaNo coffee mug. 4. 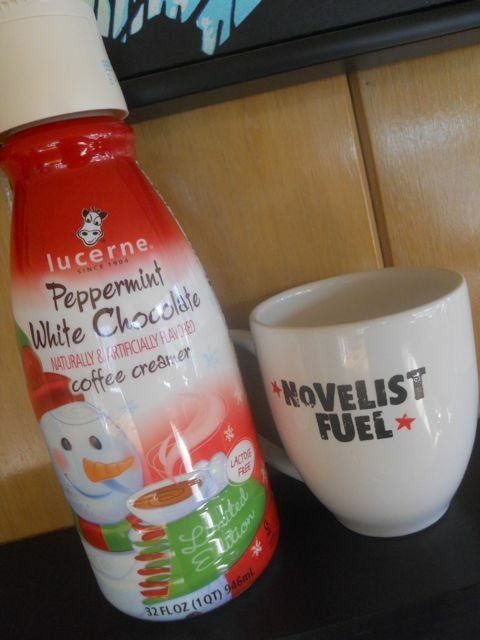 My Safeway-brand NaNo peppermint white chocolate coffee creamer. And 5. 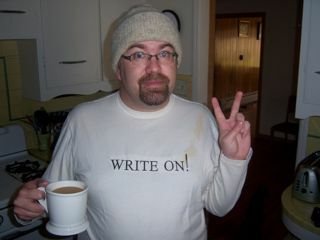 My “Write On” t-shirt, which was gifted to me by my very best friend, himself a writer, on the eve of my first NaNo and which, when all else fails to inspire, can crank up my word count like nobody’s business. This year’s story, as you will see, is about Hawaii. More specifically, about a tourist’s-eye-view of Waikiki from the cheesy (and ever-so-awesome) Food Court Oasis that is the International Marketplace, where my cousin and I once decided would be a perfect place to open a wedding planning business. Everything you’d ever need for a wedding — leis, muumuus, gift items, cheap local food, heck, even Live Entertainment — is available on-site, all under one banyan tree. I don’t plan to examine authentic Hawaiian culture, naturally, but rather to use Hawaii, the Tourist’s Paradise, as a setting for a story about family, friendship, and getting a hold of yourself. In years past, I have blogged my novel as I’ve written it, allowing a rollicking, day-by-day glimpse into my Creative Process and spamming Facebook with almost daily updates, no matter how horrifying. Last year, though, I had to quit publicizi ng my output about halfway through, the better to allow myself to smear the page with the disaster that became necessary to drag my story across quite a few rough plot holes to stick a satisfying ending. I started with a strong idea and some delightful characters, and who knows? Properly edited, something could yet come of it. But mostly it served as a reminder to me that the whole point of the exercise is to take loads of time off work, sit down, and make it happen, for better or for worse. I might post excerpts this year; I might tweet funny quotes or particularly embarrassing dialogue; I might write the entire Masterpiece in secret. But write it, I shall, and if you want to be super proud of yourself in thirty days, and maybe get out of doing the dishes in the interim, I’d encourage you to join me. It’s hard, it’s exhausting, and it’s more fun than I know how to have with a cup of coffee in one hand without spilling it. I’m born again as an artist every November; can your favorite Safeway-brand product promise that? When a long-forgotten uncle of her long-dead first husband shuffles off this mortal coil, Myrna McGee inherits a Waikiki condo and a stall at Honolulu’s International Marketplace, and along with them a ticket out of Saskatoon and a crack at a fresh start. With help from capricious local cutie Lio, she runs the Wiki Wiki Wedding Chapel and Hawaiian Honeymoon Clearing House, which quickly becomes a favorite fixture of the giant tourist trap. When the three Kaspersen brothers and their B-Movie Mom find themselves with a gay wedding to plan, Myrna and Lio sign on to deliver the perfect party on the cheap. But when opposition arises from an unexpected corner, the wedding is the least of the things they’re called on to try and save.